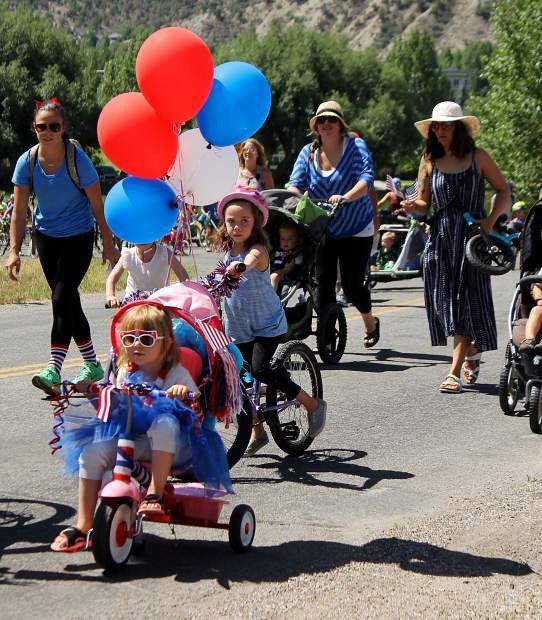 Janie Thornton powers her way up the Capitol Street hill during the Eagle July 4 Bike Parade on Wednesday. EAGLE — Kids and bikes are synonymous with summertime in Eagle. Combine the two and bang — you have a parade. For 16 years now, Eagle’s Fourth of July recipe for fun has been a community ride from Brush Creek Park to Eagle Town Park. Once their ride is complete, the kids enjoy games and treats before getting hosed down by a Greater Eagle Fire Protection District truck. At just 1-month-old, Elise Watrous may well have been the youngest 2018 parade participant. The event is always a multigenerational celebration with grandparents and parents coaxing kiddos up the Capitol Street hill before ditching the bikes, strollers, scooters and wagons to find some shade at Town Park.